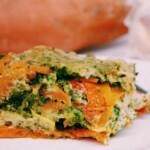 A beautiful roasted vegetable and spinach pesto lasagna starring only the freshest ingredients. Guaranteed to satisfy even the hungriest belly. Most people have a certain dish that features prominently throughout their lives. Usually it’s a celebration cake or some traditional recipe passed down trough the family over the generations. For me that dish is lasagna. And no, I am not Italian. Personally, I have never been a huge fan. All that meat, cheese and pasta…so heavy it just hurts my tummy to think about. But, for a lot of important people in my life, it is their favourite dish of all time…so it has become a bit of a constant. For my brother, it was THE dish he asked mum to make for his special birthday dinner growing up. In fact, he is now well into his twentie’s and mum still makes it for him every year, candlelit setting and all (he is a sensitive soul, my brother). For my husband, it has been his ‘go to’ dish since we first started living together, and I had to go away for work or holidays, and wouldn’t be around to eat with him for a couple of days. He would go to Aldi and buy one of those massive family sized concoctions and eat it over a few days. He can totally cook (in fact, he is an awesome cook when the notion takes him), it’s just of those things I would never buy, so for him it has always been a true guilty pleasure. This lasagna love takes a whole new level when it comes to my father in law…last year he came to visit us the whole way from Australia pretty much just to eat the 10 layer lasagna at Biba Restaurant (I have no affiliations, but the food at this place is amazing). At the time he claimed it was to visit the grandkids (and us)…but seeing as we made two trips to Biba over 5 days while he was here, I beg to differ. 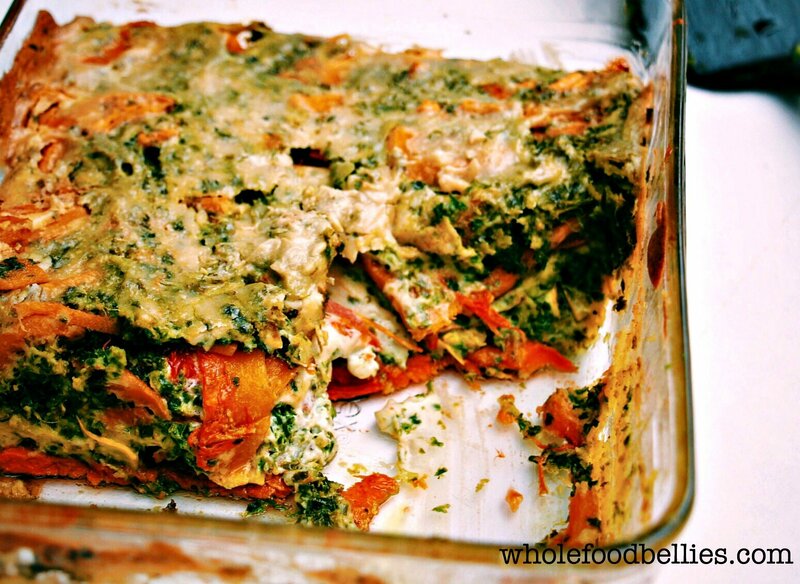 In an effort to keep the lasagna love going (and to empty my expanding veggie drawer) I put together this vegan and gluten free roasted vegetable and spinach pesto lasagna. I left out the traditional layers of pasta; and I will never look back! Sounds boring, I know…what’s a lasagna without meat, cheese and pasta? It’s delicious that’s what it is!! Both kids and the hubby devoured it (my 8 month old had like 3 servings…he is a baby food monster) and it was so comforting in only the way a lasagna can be; but without the lead belly that usually follows. 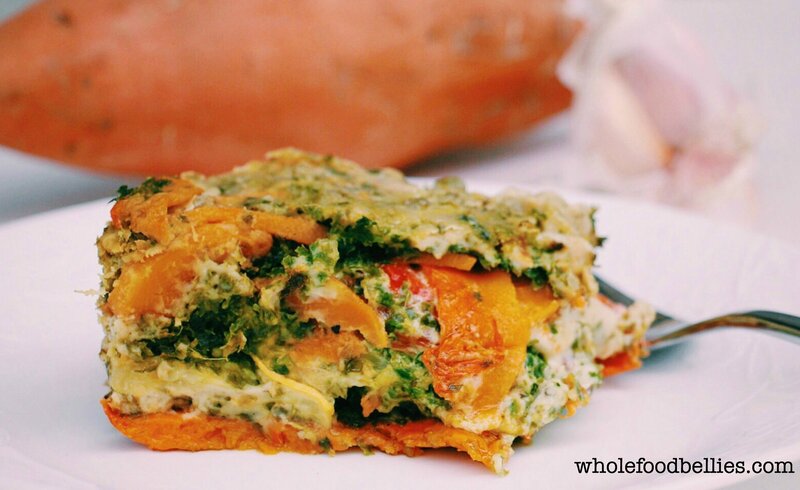 If you like lasagna, then be sure to try out roasted vegetable and spinach pesto lasagna, I promise you won’t be disappointed!! 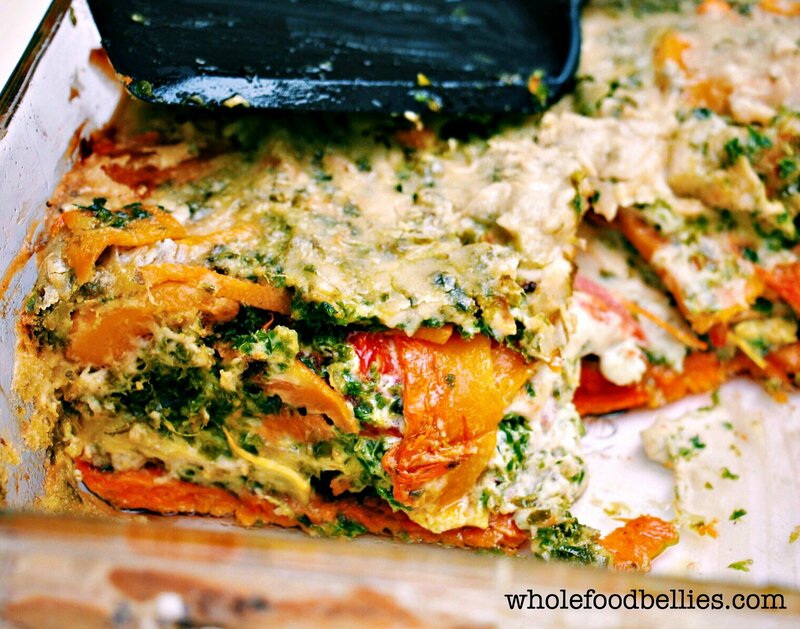 A beautiful vegan take on lasagna starring spinach pesto, cashew cream cheese (that actually tastes like cheese) and plenty of fresh vegetables. Guaranteed to satisfy even the hungriest belly. Lightly grease an oven proof dish and arrange your lasagna. 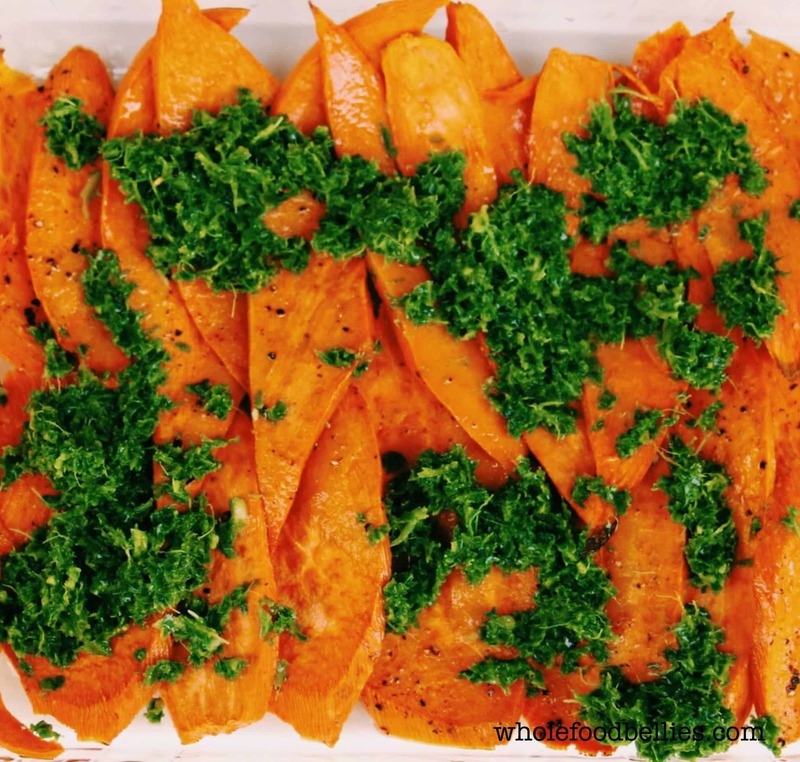 Layer the sweet potato slices on the bottom of the dish so that they are slightly overlapping. Then add some pesto and cashew cheese sauce. Add another layer with tomatoes, another with the zucchini and another with the squash. Each time adding some pesto and cashew cheese between the vegetable layers. Add any remaining cashew cheese to the top of the lasagne. Bake for approx. 25-30 minutes and serve! If you have a high powered blender you probably don't need to soak the cashews first - I don't. This looks delicious! One of my favorite things to do with lasagna is to blend up some butternut squash and mix it with the marinara sauce. I love it when a pasta dish is loaded with vegetables! Printing this and hopefully trying it soon! Looks and sounds delicious! Great pictures!! Yeah I wasn’t sure how it would go without the lasagne sheets but it worked really well!! Wow – this looks delicious! Pining to my “dinner” board so I can make this! 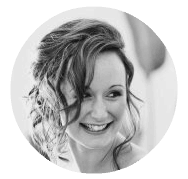 Thanks Meg 🙂 Would love to hear how you go if you give it a try! Kid you not, I just sent this to my husband as something we need to make this week! Thanks for sharing! I can’t wait to try it. Better yet, I can’t wait for my two year old to eat it!! Yay 🙂 My 2 year old loved it, even with the ‘green’ stuff! Hopefully yours does too! Yummy! I tried a similar recipe once, using only zucchini, and it turned out really watery/soupy. Maybe adding in the sweet potato and butternut squash helps with that? Oh no Nina, it’s so annoying when you try something new and it doesn’t work out! In this recipe I roast the zucchini first in order to get rid of all that extra liquid it tends to hold – so you should be fine! Let me know how you go if you give it a try! This looks delicious! I printed it! That’s the first step, right? I LOVE the photo of the baby covered in it. We have one of those too. He’s 21 months now, but he still covers himself in his food, if he likes it. I have got to learn how to program printables on my site. Is it hard to learn? Thanks for stopping by April! Printing is definitely a good first step 🙂 I have a huge folder of recipes I have printed over the years and they all end up getting used…eventually!! 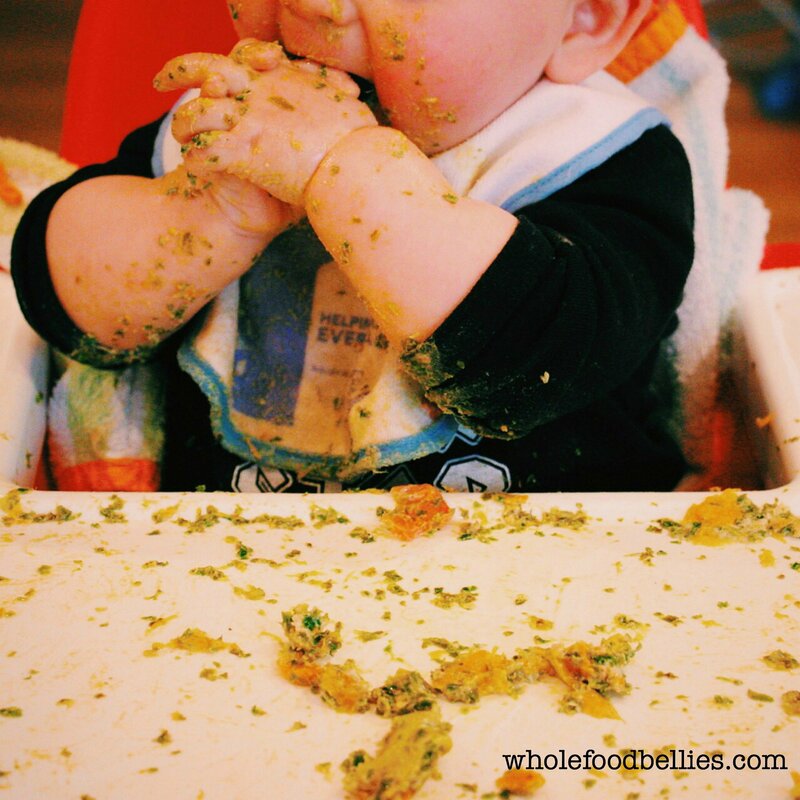 Haha, that’s how I measure a good meal these days – if they are messy enough to need a bath afterwards then it’s a success. Then we end up with bath soup (gross). 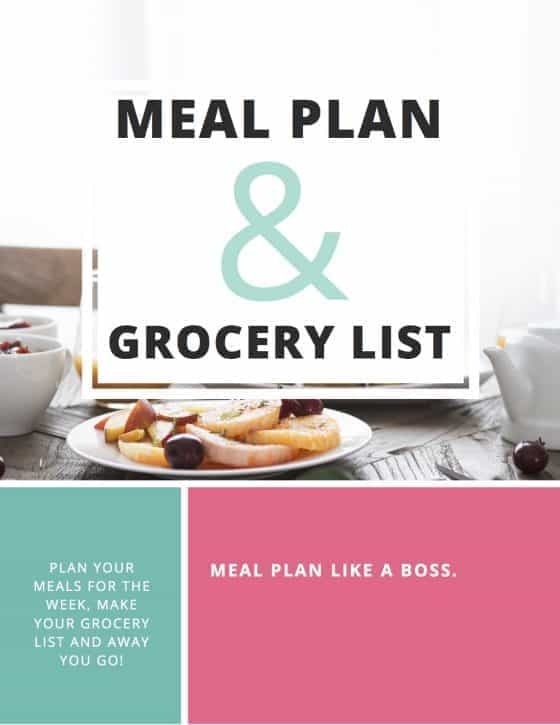 I used a plugin for the printables called Easy Recipe – obviously it is recipe specific so it would be perfect for your recipe posts but not sure about your other posts. I am sure google would have the answer though 🙂 If I come across any plugins that aren’t recipe specific I will be sure to let you know!